Before this week, no one had ever heard of the Aufay system. Now they will never forget it. Agent loyalanon and the Knights of the Order looked upon Aufay, a quiet little 0.5 security system in Sinq Laison. Despite its placid surface, they knew terrible things were happening there. 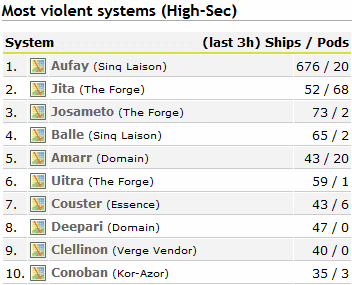 Major highsec trade routes go through anonymous Aufay. The system has long been used and abused by bot-aspirants, especially auto-piloting freighters. This, too, our Agents knew: Aufay belongs to the New Order. What you (barely) see above is not the CODEdot's entire killboard for the month. 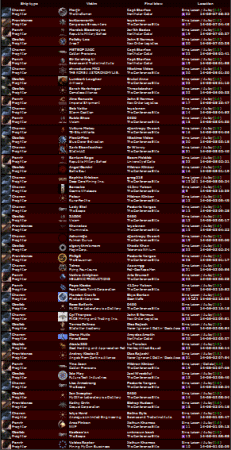 It's a list of freighters ganked by the New Order in one system, in one week. Jump freighters, of course, are the primary target for any serious ganking operation. They're not easy to take down; this is only the fifth jump freighter killed by the New Order, ever. As loyalanon continually kept me updated with reports from Aufay, we were both amazed by the degree of decadence. 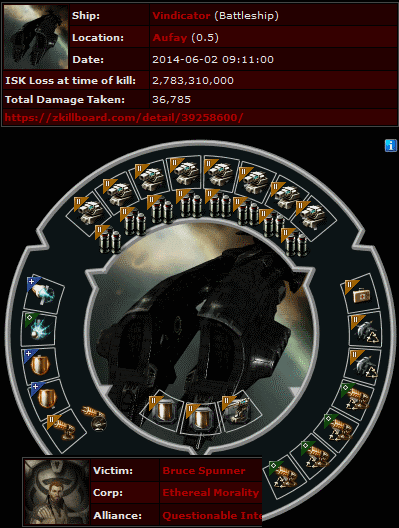 Shockingly, an Orca worth over 5 billion isk was destroyed. Judging by the cargo, the Orca contained everything the carebear owned, including a library of blueprints. Bizarrely, the anti-tanked beast had a cloak, a probe launcher, and even a warp scrambler. A kill such as this would be worthy of its own post. But in the carnage of Aufay, it is easily overlooked. Industrial ships weren't the only high-value kills in Aufay. A faction battleship worth 2.7 billion isk was vaporized for the crime of autopiloting without a permit. Or perhaps the ship merely went AFK on the gate. In the fog of war, tragedies piled on top of each other. Behold, the first freighter to be suicide ganked after the Kronos "expansion" went live. 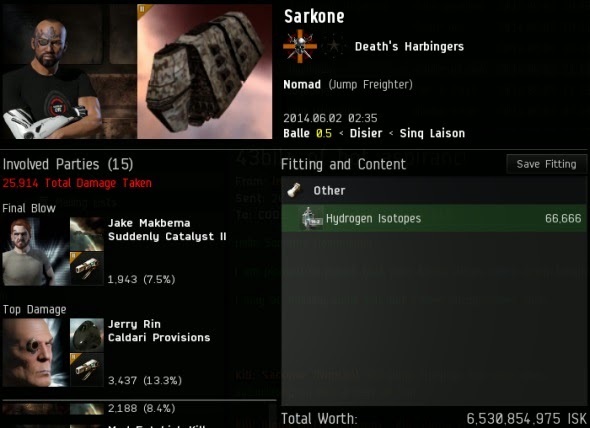 CCP's long-awaited nerf to freighter ganking was implemented by buffing freighter EHP at the expense of cargo space, and giving freighter pilots fitting options. It was all for nothing. The New Order has already become too powerful. Saturated by anti-matter delivered by our terror weapons, the post-Kronos freighters went pop, just like the ones who came before. Meanwhile, the freshly-buffed freighters turned their new fitting options into an excuse for more bot-aspirancy and immodesty. Bantam Rage, who was soon to live up to his name, chose to anti-tank his freighter for more cargo space--all so he could carry a single blueprint! The reports of dead freighters continued to pile in. Though Aufay is merely another link in the auto-pilot chain for most, pilots began to take notice. As recounted in yesterday's post, the white knights were powerless to stop the ganking. The New Order simply had too much firepower at its disposal. In despair, at least one white knight biomassed himself (or his "son" did it). 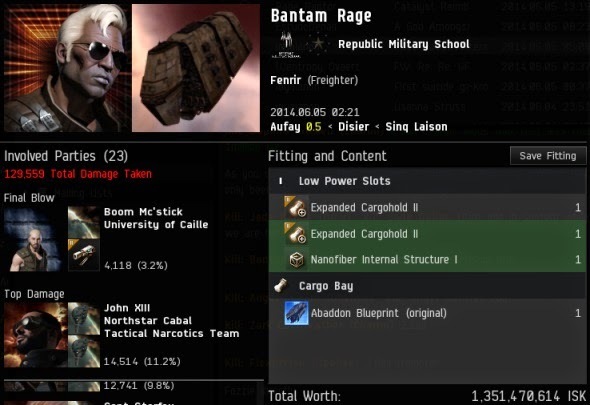 Though the freighters' EHP had been buffed by CCP that very same week, the carebears put their hope in more nerfs to ganking. That was quick! Apocalyptic visions of an Order-dominated highsec filled the rebels with dread. Two more jump freighters were killed in Aufay, the one seen above and this post-Kronos one, the sixth and seventh jump freighters ever killed by New Order pilots. The seventh jump freighter was, as I said, killed after Kronos went live. Jump freighters have lowslots now. The jump freighter pilot didn't care, and left them empty. Our Agents brought their gank ships and made the jump freighter's cargo bay empty, too. As the violence reached its peak, Aufay burned. 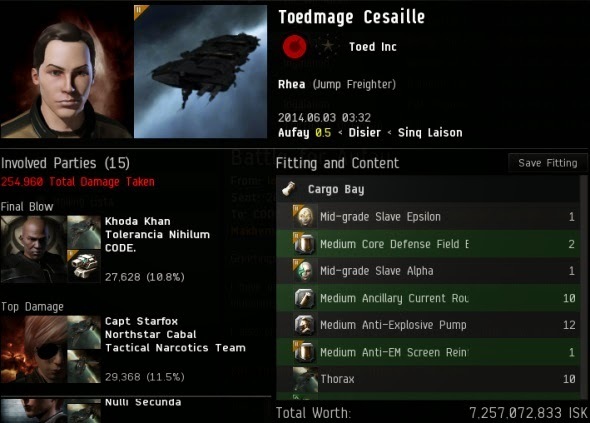 The faint red blob, extending from the words "Caldari State" to the bottom of the picture, represents Aufay. Curious pilots were drawn into the system. Not since Burn Jita had anyone seen something like this happen in a highsec system. Aufay became the killing-est system in the entire EVE galaxy. Other systems have experienced intense violence. EVE pilots have engaged in spectacular battles over territory. This time was different. This time, they fought for the Code. And the judgment of the Code rained down upon those who worked evil in the Aufay system. 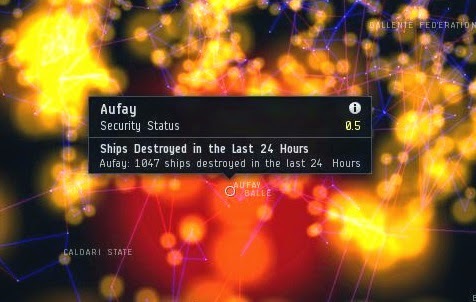 45 freighters, 3 jump freighters, 10 Orcas, and numerous other bot-aspirants were killed in Aufay in the name of the Code. 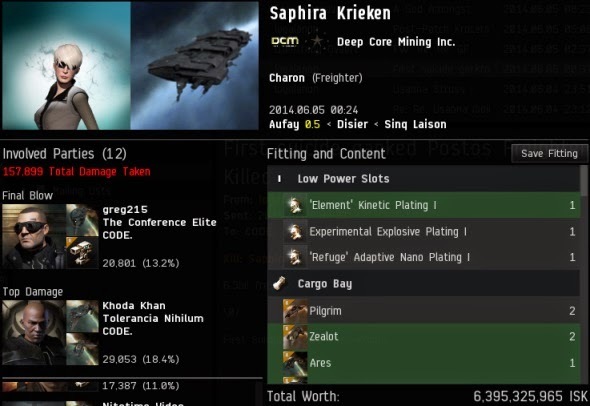 The damage is estimated at more than 200 billion isk, all in one week. 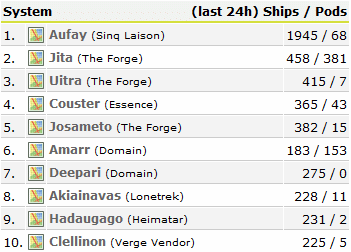 The freighter count rivals that of the first Burn Jita in 2012 (though they also killed a dozen jump freighters). That sound in the distance is the steady march of progress. 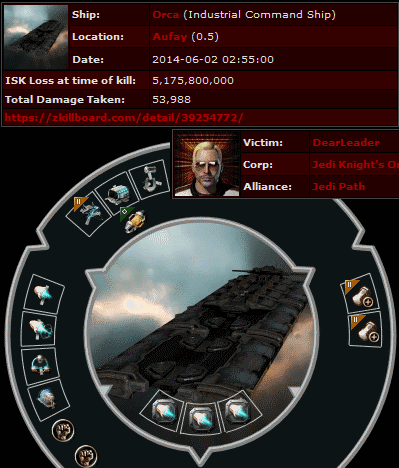 Carebears of highsec, are you listening? I am honoured and priviledged to lead these knights of the new order into battle in the name of our saviour James 315. I would not have been able to do this without the brave New Order Pilots rallying together to bring these criminals to justice. Let this be a reminder that bot-aspirancy is not permitted in all New Order Territory. Proof that "safety" in high-sec only exists when we allow it to exist. Get a permit when operating in CODE territory. Big shouts to Conference Elite, CODEdot alliance, and everyone else who made this one of the best weeks ever. Focus, James 315. We are out of time. The whole galaxy is on the brink of war because of your setback in Aufay. Not only did you bring 200 billion in destroyed assets on the plate but you are to be the one responsible for a galactic war not seen since the dronelands war years ago. Am I right? U mad bro? Do you honestly realize how many people that James 315 and his misguided agents pissed off? You do know that you guys are gonna be Eve online's number one target regardless of wardec or not. 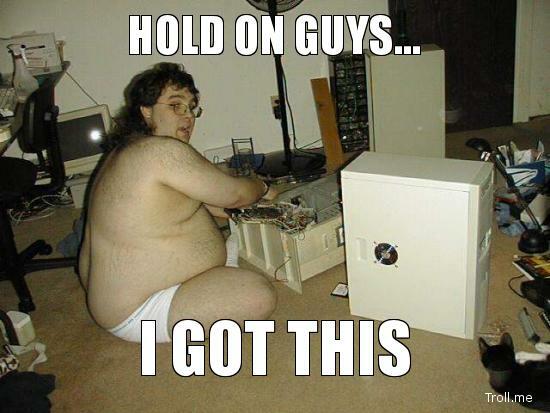 gonna be? NO has been around 2 years when is this all gonna happen? And if they did, the NO would win anyway, as that means they turned from their bot-aspirant ways and actually interacted with more than a mining laser or cruise launcher! Two years ago people said that the New Order would disappear in time. In those two years many have predicted the downfall of the New Order through various threats of null-sec friends, doxing, hacking, etc. Therein lies another difference between the New Order and it's various opponents: the New Order backs up it's claims, particularly it's claim to power over the residents of highsec. The future looks pretty damn bright for HighSec from where I'm standing. Of all the New Order campaigns I've fought in this one was the most incredible. Loyal was amazing, the fleet bros were on fire the whole week, and the guys trying to stop us were as ineffective as ever. Well done everyone! We are currently at a high point in CODE's lifetime, and it's only going to get better as we continue on our goal to 100% compliancy in High Sec. Congrats all! Progress? The only thing you're doing is making yourself more [in]famous, 315. Progress is defined by the goals you set. If you are furthering your goals, you are making progress. If that is the only thing our lord and saviour is doing, and he calls it progress... then you anonymous carebear scum can be sure that he means what he says! Had a blast last week, look forward to doing it all over again! It's a good thing the New Order is around and stronger than ever, ever growing. Without the Code and brave knights, evil would have continued to operate in Aufay this past week. Instead, the darkness was replaced with light. I fear there will be many more tens of thousands of ships needing to be blown up. But that's okay because the New Order is up to the challenge, for the benefit of highsec. Oh, and I have an idea to possibly magnify the funding of the New Order a great deal. ... Says Erotica 1, the sell out. Awesome work guys! Makes me proud to know you. CODE. turning highsec into a charnel house is a beautiful thing. I hope to be able to participate in the fun and games at some point. Until then, minerbumping remains my homepage! You guys don't realize that you are a cancer, slowly killing the EVE universe. despite the fact subscription numbers have been rising still year on year. Petition CCP to erect a statue of Supeme Protector in Jita 4-4 as no other man has contributed so much to liberation of bot-aspirant minds! I've been quoted on minerbumping.com! In my world this counts as winning at EVE, not sure I can top it though, maybe time to retire? Fellow Code Members, Supporters, Minerbumpers! I have been away undergoing advanced spiritual training in connection with Code Enforcement. My Guide has given permission for me to add my congratulations to those others of my Brothers and Sisters present here. The noble acts described above have filled with joy this lowly acolyte. Surely there can now be no Highsec dweller who is ignorant of our presence. Soon, soon they will also come to know and understand our Mission. 'loyal' by name and by nature, the one who leads such an assault is worthy of mention in the Company of the Elect. Those who fought with him - shoulder to shoulder - deserve no less, though he remains a degree above them. And what of our fearless Leader, our Saviour James, of 315 eternal fame? The tree cannot disown the root, nor the Soul the body in which it abides. We are with him as he with us, one body, one mind, one Mission. Onward then, into darkness. spreading light, striking fire. Onward Brothers, Sisters, unto Victory! Hey I made it (however briefly) onto the supporters of the month! I gotta sell more permits! It stopped being fun after YOUR freighter got popped? ironically you guys wouldn't have any catalysts to gank in without the carebears building them for you. talk about biting the hand that feeds you. That's because this is no myth. It's the reality we live in. This kind of thinking have torn apart my first corp. I can guarantee you that PVPers are capable of building their own ship, rendering you bot aspirants useless and counterproductive. Also, can someone please add "omg we built your ships" into miner bingo please? I think you may fail to understand even the most basic of economic principles, that being greed. Even were it true that *only* carebears were capable of producing the ships the New Order uses, eventually we would rich a point where miners would purchase permits *simply* to safely provide us with the ships we use against those who refuse to comply with The Code. Why? Greed. The less competition, the higher the profits. In fact, I would encourage all permit holders to take full advantage of the safety, security and peace of mind their permits offer by profiting off New Order operations. Build those Catalysts and seed the markets with them! Run those invention jobs and pump out those T2 nuetrons and magstabs the fine Knights of the New Order always need to have readily available. For an intelligent carebear, there is profit to be made, and though I prefer permit holders to have the lion's share of that profit it applies to permit holders and non-permit holders alike. Agree or disagree with the tactics used by the New Order to bring prosperity to hisec, there is profit to be made, and for every few AFK miners who give up their harvesting lasers and barge, there'll be a smart one to take their place and take their share of the profits. The fewer miners there are, the more profitable it is for those who remain. It's a win-win for everyone *except* those who log in to *not* play the game. Wow, another "Only carebears build ships" believer. Your narrow-minded grasp of Eve mechanics is tragically obvious. If only you had the vision, foresight, and capability to see what "the big picture" would look like in a universe built around the CODE. Around every gate, station, planet, and moon would be kittens, bunnies, and koala bears (all suffocated, frozen, and lifeless due to a lack of oxygen but hey, still kinda cute). Everything would be better, a true utopia in the stars. Now *that* is worth fighting for. ANOTHER GLORIOUS VICTORY FOR THE NEW ORDER!!!!!! They were not "destroyed" per-se but rather were gifts to demonstrate the New Orders conviction to the salvation of high-sec.